Simply stated, it’s a combination of physiological measurements that are taken while a patient is hooked up to a machine and is exercising at varying intensity levels on either a treadmill or bicycle ergometer. We measure cardiovascular fitness, VO2 and VO2 Max, metabolic efficiency, anaerobic threshold, rate of perceived exertion, speed/pace on the exercise equipment and much more. Knowing this data will allow us to discover your personal “formula” for health and fitness success. For athletes, we use the measurements to write out a detailed and customized training plan with specific heart-rate zones, exercise prescriptions and diet information tailored to the race or sport you are focused on. For recreational exercisers, we write similar programs depending on your needs and goals. Still wondering why you should know your VO2max? VO2 is the amount of oxygen you’re able to consume and use for working muscle, and your VO2max is a measure of aerobic power in athletes and is the maximum amount of oxygen you’re able to take in and utilize for working muscles. The more oxygen you can use during exercise, the better off you’ll be in exercise and in life. VO2 is measured by looking at ventilation (this is one reason why you’ll wear a mouthpiece during a test) and the amount of O2/CO2 that goes in and comes out. Many other factors are part of the equation. VO2max is highly correlated with endurance sport performance, as well as your ability to reach and sustain certain intensities during cardiovascular exercise. Determining your V02max is considered the best indicator of an athlete’s cardiovascular fitness and aerobic endurance. V02max can be increased in two ways: Training volume and training intensity. Testing is the only way to learn the most efficient workout intensities for your unique physiology. By discovering your VO2max we are able to design an exercise plan that will ensure proper training and maximum results. VO2max measurements can determine an athlete’s potential for success but other factors are involved, too. 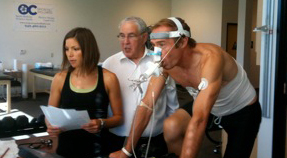 Through exercise testing, we can also measure your anaerobic threshold and metabolic efficiency. Stay tuned for our next newsletter to find out more about these concepts and how they might be more important than even VO2max. Or schedule an appointment with OC Sports and Wellness to get exercise tested right away! Exercise Testing is covered by most PPO health insurance plans. 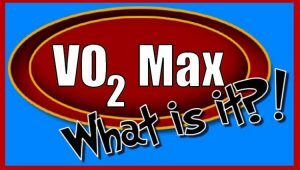 How Does Training Improve VO2max? What is Lactate Threshold Testing & Why is It Important?